And why should you? you are mesmerizing in this iridescent, edge of dawn grey. Opi I Can Never Hut Up nail polish is part of the Fiji Spring Summer collection, featuring 12 new nail lacquers and 12 infinite shine formulas, with colours ranging from rich ocean blues and pops of flora and fauna inspired shades to eye catching sunset hues and natural sandy toned neutrals, the diverse palette reflects the islands seize the day spirit. The islands lush, unspoiled natural landscape filled with vibrant colours provides the inspiration for this collection, from lush flora and exotic birds to tranquil seas and soft palm lined sands, Fiji is a picturesque dream destination. OPI is a world leader in nail polish, with exceptional formulas and fashionable shades that are rich and heavily pigmented making them long lasting and chip resistant. Each lacquer features Opi exclusive ProWide Brush for the ultimate in application. Start by applying OPI Base Coat to clean, dry nails with cuticles pushed back. For a perfect polish, apply one stroke of nail lacquer down the centre of the nail, followed by one stroke along each side of the nail. Then apply a second coat of nail lacquer, pulling colour over the tips of the nails. Shine, seal, and protect with one coat of OPI Top Coat, pulling it over the tips of the nails. 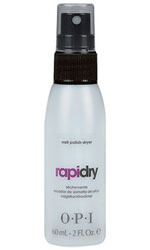 Apply 2 drops of DripDry Lacquer Drying Drops to each nail for a manicure that is dry to the touch in minutes.